The full English version of our website will be available soon! Rental of mini-containers for private individuals or contractor. 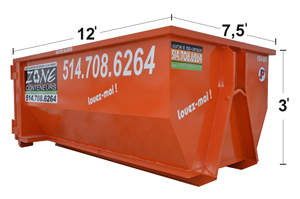 Are you looking for a waste container rental service in Mirabel, Montreal, Laval and surrounding areas? Are you renovating, excavating or doing your housework? We are here for you ! This is just a call to Zone Containers (Waste Container Rental) and our team will be pleased to guide you in choosing a container ! Zone Containers of Mirabel offers you a fast rental service of waste container (rent mini-containers for private individuals) in Laval, Montreal, North Shore and South Shore, at a fair price! At Zone Containers, we carry out the rental of mini-containers (rent of waste container) from Monday to Saturday from 6:00 am to 9:00 pm. We mainly serve the regions of the North Shore, the Montreal region and certain locations on the South Shore (Mirabel, Blainville, Repentigny, Mascouche, Terrebonne St-Eustache, St-Jérôme, St-Colomban, Gore, Lachute, St Ste-Sophie, Deux-Montagnes, Ste-Marthe-sur-le-Lac, Boisbriand, Lorraine, Rosemère, Bois-des-Filion Saint-Alexis, Rawdon, Boisbriand, Sainte-Thérèse, Rosemère, Outremont, Mount Royal, Dollard des Ormeaux, Westmount, Longueuil, Boucherville, Brossard, etc. .). Choose Zone Containers for the best waste container rental (private container rental) in Laval, Montreal, North Shore and the South Shore and the surrounding area! We rent containers daily, weekly or monthly. On service agreement, you can also rent annually. We have trucks specially adapted for delivery in narrow lanes.It is possible to bypass several obstacles and thus place the mini-container wherever you want, which will facilitate your work. We protect your entrance with planks below the containers. Zone Containers offers a 2017 promotion for the rental of waste container (rent mini-containers for private individuals)! Make 9 rentals on your loyalty card and get the 10th free rental! Also, you can save big if you rent the container for only one single material, such as concrete or asphalt, wood etc … Inform yourself! To speed up your booking, you must have your credit card number handy as well as the information needed for your reservation. You can contact us 7 days a week to reserve a container or mobile storage box at 514.708.6264. Zone Containers located in Mirabel offers containers of all sizes ranging from 5 cubic yards to 20 cubic yards, for the recovery of dry materials: wood, metal, earth, stone, glass, asphalt shingles, concrete and brick, household appliances . We also accept certain non-recyclable materials such as gypsum or wool but these must be separated from each other. 12 feet long x 7.5 feet wide x 1.5 feet high. Ideal for landscaping and earthworks, roofing and grounds. 12 feet long x 7.5 feet wide x 3.0 feet high. Ideal for cleaning, small demolition or renovation of a bathroom, a small roof renovation or the cleaning of a shed, a garage. 12 feet long x 7.5 feet wide x 4.5 feet high. Ideal for medium-sized works such as renovation of kitchen and floor, demolition of a few rooms completely, a repair of average roofing or for a large household after a move. 12 feet long x 7.5 feet wide x 6.0 feet high. Ideal for large jobs such as a complete floor demolition, a major expansion or a move. All recyclable materials such as: wood, metals, earth, stone, glass, asphalt shingles, concrete and brick, household appliances. We also accept certain non-recyclable materials, such as gypsum or wool, but these must be separated from each other. All chemicals (eg oil or paint), propane tanks, railway ties, contaminated soil, tires (on request), mattresses, contaminated products, batteries. You have scraps to dispose of and you are not sure if these will be accepted? Contact us before you include them in the container! Weighing system inside trucks, which means you pay for what is in the container and not an estimate like several competing companies. No surprise! Your 10th container rental is always free! * Conditions apply.